White sand beaches and the peaceful blue waters of the Gulf of Mexico define Gulf Shores, Alabama. 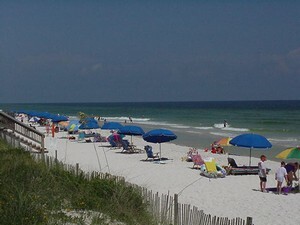 A perfect spot for a family summer vacation, people of any age can take in the sun and spend their time at Gulf Shores rentals just relaxing. It is the perfect getaway from hectic city life and the waters are warm enough for anyone to take a swim or go out on a boat, but here there is not just one beach, but many which you can take your pick of, and feel right at home when you stay at Alabama Shores vacation rentals. A beach vacation should be just what it was intended for - relaxing. Small motel rooms can be stressful on the family until everyone gets outside, but at Gulf Shores Alabama vacation homes, you feel like you are residing by the beach, and it can be hard to believe that you don't already live there. At Florida Point, Cotton Bayou, or Gulf State Park, picturesque views seem like they are straight out of a postcard. Public beaches are plentiful in town and are close to many Gulf Shores rentals, so the white sand and beautiful Gulf may only be steps away. For the adventure seekers, charter a boat out onto the water. The Gulf is peaceful and calm most of the time, so a leisurely ride off the coast can bring the whole family together for a memorable experience. Fishing charters and cruises are also offered in the area, so if you want to make a catch and bring it back to the Gulf Shores rentals to cook up a tasty, healthy meal of freshly caught fish, you can do that as well. Boat captains who are native to the area can guide you to the best areas and almost guarantee a fresh catch in the rich waters off Gulf Shores. Passing time off the beach can be done at the Gulf Shores Museum, where you can indulge in the history of the local area. Relaxation can be mixed with mental stimulation as well. History can also be experienced at Fort Morgan, a short drive out of town, and be boarded on the USS Alabama in nearby Mobile. Miniature golfers can take in a few swings at Pirates Island Adventure Golf, where creative courses can be fun for the whole family. Shopping, dining, and entertainment can all be taken in at Gulf Shores, and the savings on your budget by staying at Gulf Shores rentals can be used to go on the many excursions the city has to offer. If a non-congested family beach getaway is the thing you are looking for, then Gulf Shores Alabama vacation homes are the perfect plan. Many of the seaside resorts along the Gulf and Atlantic coasts are crowded during the summer, but here you can enjoy a spot on the beach, take a boat ride, or visit a national park. Comfort and relaxation stay with you the entire time, and the whole family can cherish the experience and memories. Check out nearby Biloxi , Fort Walton Beach , Ft Walton Beach , Navarre Beach , Orange Beach , Pensacola Beach , Perdido Key .